Ordering food in a foreign country is often 1/3 guesswork (thank goodness for cognates! ), 1/3 experimentation and 1/3 luck. Sometimes the luck part works out in your favor, which was absolutely the case at Casa Tomate in Sevilla where I had arguably one of my favorite meals in Spain. Handwritten chalkboard menus lined the street, boasting a special for 7 tapas for 17 euros – a perfect opportunity to try several different items (including my newfound Spanish indulgence of brie with caramelized onions). Everything we ordered was delicious, but what stood out the most was the espinacas con garbanzos. 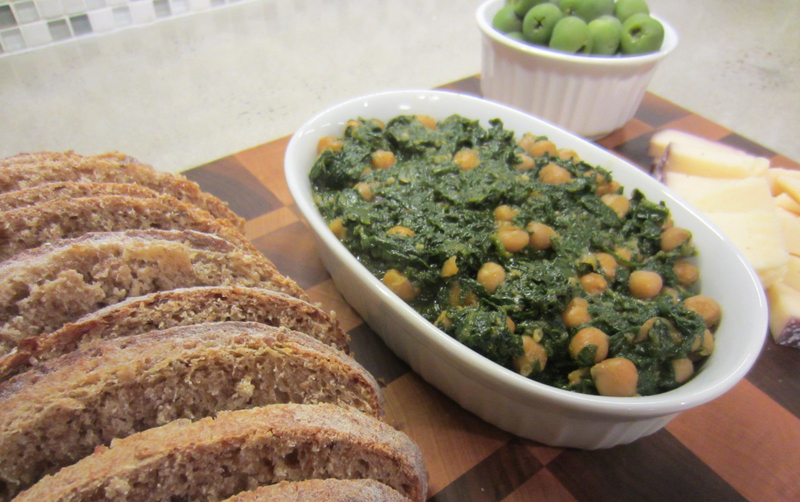 Simple in concept, this tapa is exactly what it sounds like, spinach and garbanzo beans cooked together with delicious spices and served with toasts or bread. One note, this recipe makes a LOT so it’s definitely a meal in itself or perfect for sharing with a group of friends alongside good Spanish wine. 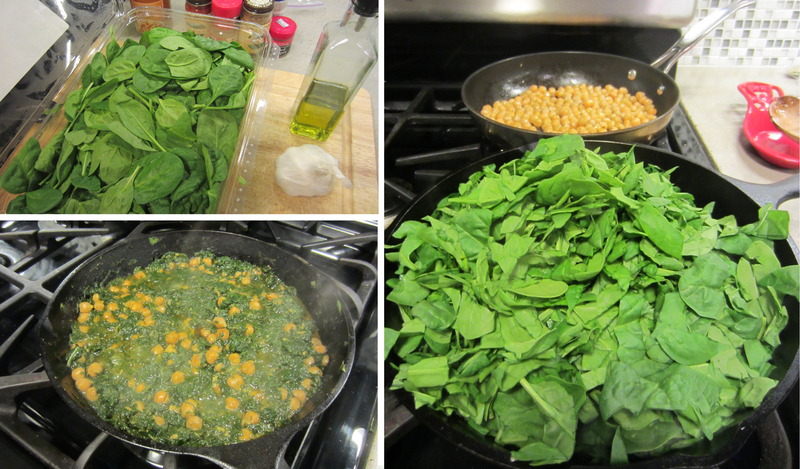 Spray a medium skillet with cooking spray and add chickpeas, seasoning with salt and pepper. Lightly toast over medium high heat, shaking occasionally until slightly golden, about 10-15 minutes. Meanwhile in a large cast iron skillet heat 1 tablespoon of olive oil over medium high heat, then add the garlic and sauté until lightly brown. Stir in cumin, coriander and sweet paprika, and add salt and pepper to desired taste. Cover the skillet with foil (or transfer to an ovenproof casserole dish) and place in oven for 10-15 minutes until the chickpeas have softened and the liquids have and nearly evaporated. Recipe adapted from Big Girls Small Kitchen. 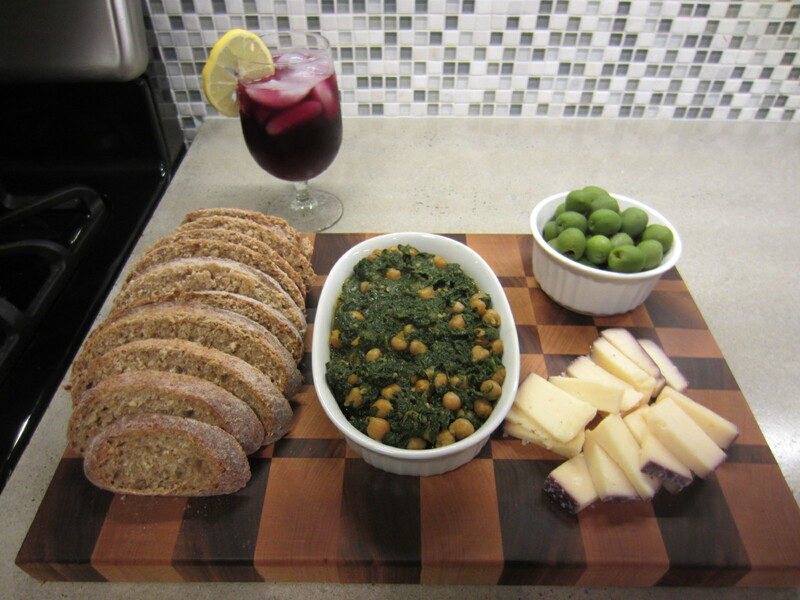 Spanish tapas with tinto de verano.